Although the club does not meet in its original location, the Benevolent and Protective Order of Elks (B.P.O.E.) #948 is one of the oldest fraternal organizations in Miami. The organization is referred to as the “Elks Lodge”. The club currently operates at 10301 SW 72nd Street in Miami. Within the first decade of incorporation, the early pioneers of Miami looked to national fraternal organizations to provide camaraderie and civic spirit to the young city. 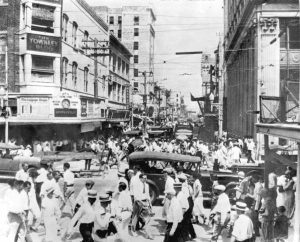 If Miami were to be taken seriously as a metropolitan area, the notoriety offered by national fraternal organizations provided city organizers the credibility they sought. The Elks Lodge was one of the organizations that took root in early Miami. While the Miami chapter of the Elks Lodge was not the first fraternal organization in early Miami, it has stood the test of time. Chapter 948 of the Elks Lodge was officially established on July 13, 1905. The lodge did not have its own building until a few years later, but thrived in its first several years. The lodge’s club room was originally located in the Townley Building at 301 Twelfth Street. This would have been at the west corner of Flagler Street and NE First Avenue in today’s address scheme. The Elks occupied the top floor of the building. The Townley Brothers operated the first drug store in Miami from two locations. They had a branch in Julia Tuttle’s Hotel Miami. However, the main branch of the drug store operated out of the same building that the Elks rented for their club room. 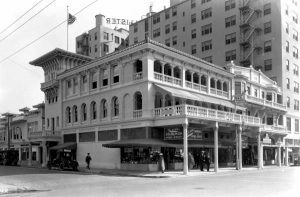 In July of 1897, the Townleys abandoned their branch in the Hotel Miami. The Elks Lodge was located at the Townley Building for a little over a year when it experienced a damaging hurricane. The seventy five mile per hour hurricane hit on October 18, 1906. It did significant damage to the building. Part of a wall to the building had been blown off. The Elks club room experienced significant water damage. Buildings in 1906 were not built to withstand hurricane force winds. After operating out of the Townley Building for five years, the Elks Lodge purchased a lot located at the northeast corner of Flagler Street and NE Third Avenue in 1910. The Elks erected a beautiful Moorish style building and moved into their new location in roughly 1912. The new Elks Lodge stood alone at its corner until development caught up to the area just a few years later. The lessons of the 1906 hurricane were not forgotten by the architect of the new Elks Lodge. The building was fortified with reinforced concrete to ensure that it would fare better in the next hurricane. During World War I, the Elks turned over a portion of their building to the Red Cross. It was also a popular place for tourists to visit during the winter season in Miami. In 1917, the McAllister Hotel was constructed directly east of the lodge. The hotel was built by a wealthy widow by the name of Emma Cornelia Hatchett McAllister. However, McAllister ran out of money in 1919 after only seven stories were complete. New owners took over and completed the hotel. At ten stories in height, the hotel was the tallest building in Miami until 1925. The hotel stood at Flagler Street and Biscayne Boulevard until it was razed in 1988. In 1923, the Elks Lodge was remodeled and expanded. The first floor was commercialized in order to generate revenue for the club. The membership dues were not adequate to meet the club’s debt and expenses. The club leased space to the criminal court of record in 1925 when the new Dade County Courthouse was under construction. The court was only at the Elks Lodge for a short period and moved to one other temporary location prior to moving into the new courthouse in 1928. Revenue generated by renting the ground floor provided needed funds for the club’s operating costs. In addition, the Elks used revenue from rents to begin a fund for the lodge’s ministration to the needy. The downtown location served the club very well through the 1950s. However, by the latter part of the decade, the club felt downtown Miami was getting too crowded and decided to move to a quieter part of town. According to a Miami Herald article referenced in the historic designation report for the Miami Circle at Brickell Point, the Elks purchased the northernmost five acres of the Brickell home grounds in 1948. This includes the area known as Brickell Point, which many people today refer to as the Miami Circle. There was a stipulation in the sale of the property by Maude Brickell that she have the right to continue to live in the Brickell Mansion on the property until her death. The Elks honored this agreement and the Brickell mansion remained at 501 Brickell Avenue until her death in November of 1960. The mansion was razed on February 14, 1961. Although the Elks Lodge purchased the property in 1948, they did not begin constructing a new building on the former Brickell property until 1958. The new lodge opened at 495 Brickell Avenue in March of 1959. In July of 1961, a story was syndicated around the country about gambling equipment found on the property of the Elks Club in Miami. 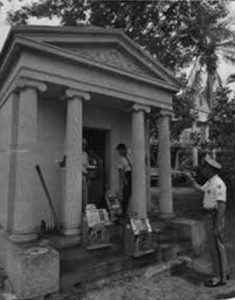 The Brickell Mausoleum was considered part of the Elks property and police were notified of five slot machines that were being stored in the vacant mausoleum. Maude Brickell had moved the coffins out of the family mausoleum in 1948 to the Woodlawn Cemetery. She felt that the area was getting too noisy for her family to rest in peace. Given the vacancy, someone felt that storing the illegal machines in the Greek-columned mausoleum would be safe from the authorities. Their plans were spoiled by a curious groundskeeper. Once discovered, the slot machines were turned over to the city property bureau. By 1980, the Elks felt it was time to move out of Brickell. They sold the property to a group that intended to construct a Holiday Inn at Brickell Point. The Elks sold the land and chose to share a location with the Coral Gables chapter of the Elks. They moved out of the Brickell neighborhood in January of 1980. The Elks Lodge building was demolished soon after the club moved out of Brickell Point. The 17-story Holiday Inn was completed and opened in the 1981 – 82 timeframe. It later changed brands and became a Sheraton in 1987. Meanwhile, the Elks remained in the Coral Gables location until they moved into their own building in Kendall. The chapter remains an active chapter in the South Miami / Kendall area at their location on 72nd street. Following the Elks moving out of downtown Miami, the beautiful Moorish style former home of the club eventually got incorporated into the McAllister Hotel. Along with the hotel, the former home of the Elks Lodge was demolished in 1988. The Elks Lodge thrived from the time the chapter started in 1905. The members consisted of a number of the early pioneers of Miami. Isidor Cohen, Everest G Sewell and many other prominent early merchants and business leaders were members of the lodge. The first mayor of Miami, John B Reilly, was the second Exalted Ruler of the lodge. Other rulers included S.M. Tatum of the Tatum Brothers Land Company and Edwin N. Belcher of Belcher Oil. Fraternal organizations may not be as popular as they once were, but the Elks Lodge has stood the test of time. While the location of the lodge has changed through the years, the legacy of benevolence and charity are still very much alive. The legacy continues over 111 years after the founding of the Miami chapter of the Benevolent and Protective Order of Elks #948. Book: “Historical Sketches and Sidelights of Miami, Florida”, Isidor Cohen, pp 69 – 70. Book: “Miami and Dade County Florida”, E.V. Blackman, page 36. Book: “Miami The Way We Were”, Howard Kleinberg, page 66. Designation Report: “Miami Circle at Brickell Point”. Eugene Register: “Machines Raised from the Dead”, July 19, 1961. Sun-Sentinel: “The End of An Era”, Buddy Nevins interview of Dr. Paul S. George, January 6, 1988. Cover: Elks Lodge in Downtown Miami in 1912. Figure 1: The Townley Building on Flagler Street and NE First Avenue. Courtesy of Florida Memory. 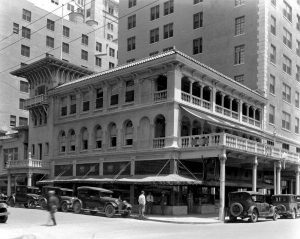 Figure 2: Elks Lodge in Downtown Miami in 1924. Courtesy of Florida Memory. Figure 3: Elks Lodge Downtown in 1926. Courtesy of Florida Memory. Figure 4: Elks Lodge at Brickell Point. Courtesy of Elks Lodge #948. Figure 5: Slot Machines in Brickell Mausoleum in 1961. Courtesy of HistoryMiami. Be the first to comment on "History of Miami Elks Lodge 948"